Then this emergency/camping Firestarter is meant for you. Our fire striker kit boasts full coverage for the whole family in emergencies or on your camping trips. Our Firestarter is made of sturdy Magnesium Ferrocerium rod and a striker. Also, included in the firestarter tool kit is a versatile concave toothed scraper tool equipped with a hex wrench, a ruler, map scale, and bottle opener all attached to a lanyard, so you do not need to be looking for individual parts when the need arises to use your dear Firestarter. Our fire starter is durable, lightweight, minimalist, simple and applicable to a wide range of situations, including leisure and emergency. It is capable of producing a spark of 5.500 F which helps starts fires pretty fast. It is the ideal accessory for men and women and able to work well in a wide range of weather conditions from dry to snowy. The handle is of high-quality hardwood with a good grip. When needed, all you need to do is shave off a small quantity of magnesium using the serrated part of the scraper, onto your tinder.To start the fire, hold the rod at an angle and slide the striker lengthwise on the magnesium rod so that sparks can fall on the tinder and magnesium combo and, voila, You got a fire! This Firestarter tool is better than the average firestarters in the market. With a performance of over 15,000 strikes, our product promises to be your survival mate of choice. Order yours today and always be prepared. 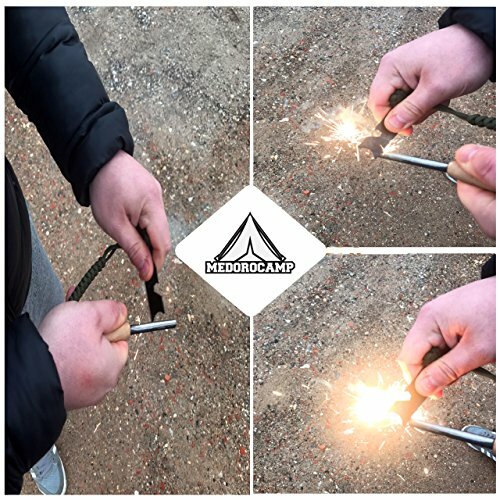 ✅ MULTIPLE WEATHER APPLICATIONS: Medorocamp Magnesium Firestarter is waterproof and capable of starting a fire in various weather conditions including water, snow, or elsewhere, including underground in times of emergency. The flame it produces is wind-resistant up to 30 mph with a heat capacity up to 1000 degrees Fahrenheit. ✅ USER AND ECO-FRIENDLY: This insulated flame starter kit does not include ozone-degrading fuels or chemicals. It is made of 100% user and environment-friendly materials such as volcanic rock, recycled wood and eco-friendly paraffin wax. The by-products are highly biodegradable too. Medorocamp is a strong advocate of environmental protection. ✅ MULTIPLE APPLICATIONS: This versatile fire making kit is a lifesaver with applications to many occasions such as hiking, biking, fishing, barbeque, hunting, and in emergency situations. It can be used safely by men and women, old and young, without causing any harm. It comes with a serrated scraping tool which serves as an opener, a map scale, a bottle opener and ruler, all very essential parts of camping and emergency situations. ✅ PREMIUM DURABLE MATERIALS: The ferrocerium is of the highest quality available in the market. It boasts up to 15,000 strikes, and, can last for up to 20 years if properly handled and stored. With our device, you can be sure of the best value for your money. This firestarter is designed with longevity in mind. ✅ LIGHTWEIGHT AND TRAVEL-FRIENDLY: This fireplace lighter is lightweight and minimalist in design. It is portable enough to be in your pack-pack while going on vacation, hiking, hunting, biking or skiing. It will not take too much space in your bag, nor increase the weight of your baggage. It is your ideal travel mate. Get yours today and travel with more confidence. If you have any questions about this product by Medorocamp, contact us by completing and submitting the form below. If you are looking for a specif part number, please include it with your message.